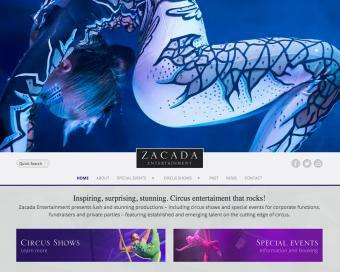 We're very excited about the new Zacada Entertainment branding and website. And equally excited to introduce Zacada Entertainment to the you. We hope you will visit us often to check out what we're up to... and to see photos of our artists and latest events. You'll also notice that this new website is 'responsive', which means that it will reformat to view beautifully on any type of computer or mobile device. We hope you will visit us regularly. And, if you see something you like here, please pick up the phone and call us!